The Promise does something good and does something bad. The good is that it draws attention to a little-known bit of history that needs more exposure. The bad is that it drowns in a second-rate love story that pushes the film to be almost boring, insipid and predictable. Fortunately, The Promise inches towards barely being tolerable, ironically when we actually forget about the 'love story' and focus on the situation the characters must suffer. Young Armenian Michael Boghosian (Oscar Isaac) is an apothecary in his village in Turkey, but he dreams of becoming a doctor. As a poor lad, he cannot afford medical school in distant, exotic Constantinople (now Istanbul), so he does what many poor lads do: gets engaged to a pretty girl he is not in love with to get the dowry. Said girl, Maral (Angela Sarafyan, and for what it's worth one of the few actual actors of Armenian descent that plays an Armenian) is pretty but has to wait for her betrothed as he goes off to the big city. Once in Constantinople, he goes to his rich uncle Vartan (Kevork Malikyan, another actual Armenian). At this point, I'd like to ask why the Boghosians didn't just ask Vartan to sponsor his distant nephew instead of basically pimping himself out, but quibbles. Now safely in Constantinople, Michael makes quick friends with Emre Ogan (Marwan Kenzari), a Turk who has no interest in being a doctor but was pushed into it to please his father. That, and to avoid the army. Ogan is not like other Turks who have a hatred for Armenians, and as a rich man he squires Michael about. Michael also meets Ana Khesarian (Charlotte Le Bon), an artist who has returned home to reestablish her roots. Her French sojourn may have given her a French accent, but she is proudly Armenian. She also is involved with Christopher Meyers (Christian Bale) an American reporter who is quick with a quip and a drink, and who detests the Turkish/German alliance. Now comes the First World War, and the Ottoman Empire has sided with the Germans. Michael and Emre try to stay out of the fighting, but that soon becomes impossible as the Ottoman Turks are beginning their purge of the Armenian people in what became a genocide. Michael and Ana struggle with and against their feelings, but eventually have a liaison, while Chris is busy documenting the Turkish assaults on the Armenian people. Michael is eventually forced into slave labor, but thanks to a suicidal fellow prisoner manages an escape and a return to his village. He reunites with his father and mother Marta (Shohreh Agdashloo), and also with Maral, whom he marries as a way to save his life. Despite his passion for Ana, Michael feels a loyalty to Maral, and they consummate their marriage, eventually leading to a pregnancy. This is the worst time to be giving birth to an Armenian baby, as the campaign of extermination by the Turks not only continues but intensifies. Ana and Chris manage to spirit away Vartan's wife Lena (Alicia Borrachero) and daughters to safety with Marta, but she tells them Michael is dead, suspecting Ana is the woman her son fell in love with. Chris and Ana continue their own work in documenting and helping Armenian orphans respectively, but time is against them. Chris' work gets him in trouble with the Turkish officials who threaten to execute him as a spy. It takes the personal intervention of U.S. Ambassador Henry Morgenthau (James Cromwell) to save him. It does not save Emre, who is discovered to have tipped off Morgenthau and is summarily executed. Ana, Michael, and many other Armenians are making a fierce last stand in the mountains, pushed against the sea. Chris gets a ride on a French ship steaming towards their rescue, and ultimately, many lives are lost, including the linchpin of this love triangle. Of his whole family, only Michael and his niece Yeva survive to find refuge in America. What ultimately weakens The Promise is what the film imagines is its strongest point: the love story. 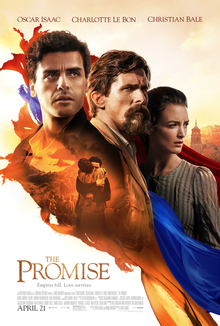 The Promise all but drowns under its own lushness and embarrassing efforts to be sweeping in this somewhat tawdry love triangle. You cannot get more lush and embarrassing than when Michael and Ana finally give in to their desires. After surviving a riot where Turks were attacking Armenians on the streets, they take refuge in a hotel. There, with the flames of burning shops lit in the windows, they too experience the flames of passion. One can be poetic in imagery, but this goes into downright parody. It's clear that Robin Swicord and director Terry George's screenplay was cribbing from such films as Doctor Zhivago (with Michael going from his mistress' bed to his wife's bed, loving his Tanya while dreaming of his Lara), Titanic (Ana's final moments) and even the miniseries Holocaust (how the Armenian community, well-integrated into the dominant society, is quickly overrun by Turkish Armenian-phobia). One could almost call The Promise a mash-up of these and other films. Even the title makes a desperate plea to make this story oh so passionate. It's also clear that it was making a mighty mess of it. This is because as a triangle, it is neither interesting or believable. Isaac, Le Bon and Bale all act if they are fully aware they are in a sweeping love story in a critical moment of history. They do not behave as actual people, at least when they are all attempting to make us feel as passionately about these conflicting romances as they were directed to. The Promise as a title is a bit of a misnomer, since the main 'promise' in The Promise is that of Michael to Maral, when he refuses to end his betrothal despite not being in love with Maral because he made 'a promise'. It's a curious thing that The Promise works best when the characters and movie have no interest in their love lives. Some of the scenes of the Armenian Genocide fill us with horror and shock, and the Armenian plight to survive and escape the Turkish extermination plans, particularly as they make their stand on the mountains and flee to the French ships, are when The Promise gets exciting, interesting and moving. Perhaps this is what hampers our actors, as so much time is taken up in an effort to be sweeping that it did not have much time to be good. Isaac got that look of forlorn angst as Michael. Bale was all righteous indignation as Myers. Le Bon was better than them as the more assured Ana, and I admire how her French accent was explained away in a virtually throwaway line. The Promise could have been more. It could have worked as a film commenting on the present by drawing lessons from the past. I could not help thinking of how the Yazidis were driven to the mountains by ISIS when I saw the Armenians deciding to fight rather than surrender or be driven into the Syrian desert. The horrors and evil of the Armenian Genocide, which all Turkish governments refuse to acknowledge or admit, deserves to be told. It certainly deserves to be told in a better film than The Promise.